Gloria was always the kid in elementary and high school who was prodded by her classmates to draw the teacher. A good way to get into trouble. But she never planned an art career- too much insecurity. So no art school, but rather a major in psychology and employment in the mental health field which thrives on insecurity. Then after 4 years of taking classes while raising two children, Gloria received her M.ed in Counseling at William and Mary and immediately joined the staff of the Daily Press as a news illustrator and courtroom artist ( including the spy trial of John Walker’s brother, Arthur). In 2008 she was nominated for the prestigious ALLI award. 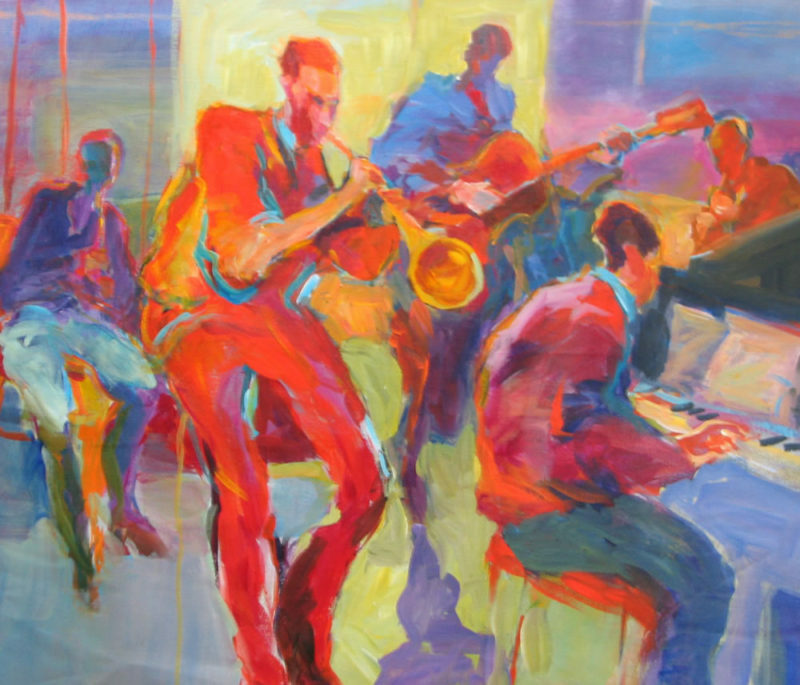 She has been a wine label illustrator, an art teacher, lecturer, book and magazine illustrator, workshop teacher, and all around contributor to the arts in her community. She has shown in many galleries, solo shows, prizes and has collectors such as Tom Clancy, JoAnn Falletta, Fuzzy Zoeller, the family of Bruce Hornsby and Ernie Els. Her work was used in posters for the Harborfest in Norfolk and for three years for posters in Hampton Bay Days. Large pieces of children by Gloria hang in the Children’s Hospital of the Kings Daughters in Norfolk. A painting of the submarine “Newport News” is in the collection of Harbor Bank with prints in every Newport News public school. One of her paintings would have been seen on the Dexter series had the camera gone to the top of the stairs and there are glimpses of two paintings in the December 2011 TV movie “Christmas Kiss”. Live music provided by Lori de los Santos & John Sullivan. Lori de los Santos is a singer/songwriter who lives in Gloucester, Virginia. 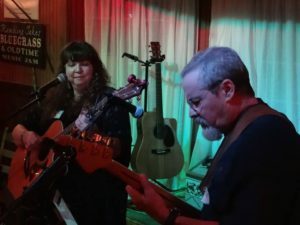 With her husband, John Sullivan on bass, they play acoustic songs from all genres of music including folk, blues and Americana as well as some of Lori’s original songs. Lori has been playing guitar and writing songs since the mid-1970’s, influenced by artists such as Joni Mitchell, Bonnie Raitt, Billie Holiday, Lead Belly and Flora Purim. She was one of the top ten finalists of the TAO Sea Level Singer/Songwriter Festival Emerging Artist Contest of 2009 and has performed with local musicians and at the Blackberry Jam Festival in Franklin, Tennessee with “Carol & Dale”. She is one of the vocalists on their album “Be Here Now”. Currently, Lori is performing and touring with Williamsburg singer/songwriter, Mark Rogers, as part of his band. John Sullivan has been studying bass for the past four years and has begun to perform with local musicians as well. He decided that after years of being a “roadie” he wanted to play! The opening is from 6:00pm-8:00pm and is free and open to the public, with beer, wine and paninis available. The exhibition runs for the month of October.